" Digital stories help students with time management, problem solving, communication skills and interpersonal qualities such as teamwork, critical thought, information collection, data interpretation, text and image analysis, synthesis and self-evaluation. " 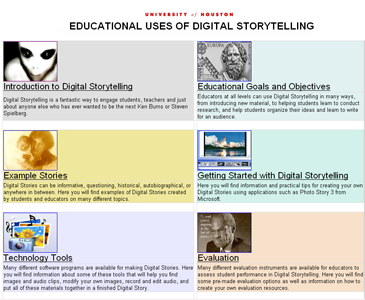 The primary goal of the Educational Uses of Digital Storytelling website is to serve as a useful resource for educators and students who are interested in how digital storytelling can be integrated into a variety of educational activities. The site was originally created in 2004 and faculty members and graduate students in the Learning, Design and Technology Program at the University of Houston College of Education continue to maintain the site and add new content. Our long term goal is to make the Educational Uses of Digital Storytelling website a comprehensive clearinghouse of information for both those just starting to use digital storytelling as well as for educators, graduate students and researchers who want to deeply explore the many facets of this educational technology tool. Although we stress to our students that they should try to create their own materials for use in their digital story projects, some of the digital stories contained on this site include still images, audio files and video clips that were found on the Internet using commonly available search engines, websites such as YouTube, as well as from television broadcasts, commercial VHS tapes and DVDs. We hope that these digital stories can serve as examples to educators of how the power of accessible multimedia can be used to engage students in today's K-12 and higher education classrooms and excite them about the possibility of creating their own digital stories. The II Sessions on Personal Digital Storytelling in Formal and Social Education, will take place on 28th and 29th of November, 2016 in Barcelona, Spain. The conference will include conference sessions, roundtables and presentation of communications on creating personal digital stories (autobiographical narratives, life stories), with educational and expressive purposes, in formal educational contexts, or educational intervention in other areas such as social education, health services, social work, civic associations, to name a few. The event is aimed at teachers and workers of different educational levels, trainers, master and Ph.D. students (especially those in areas such as Teachers’ Training, Education, Social Education and Social Work), as well as researchers and professionals interested in the subject. Powerful Tools for Teaching and Learning: Digital Storytelling is a free 5-week MOOC that introduces educators to digital storytelling and explores ways that educators might use this technology tool to enhance their students’ learning experience. The MOOC will provide a solid foundation in the basic components of digital storytelling with tutorials, example stories and links to additional readings. The MOOC will also provide hands-on opportunities for learners to create their own digital stories. 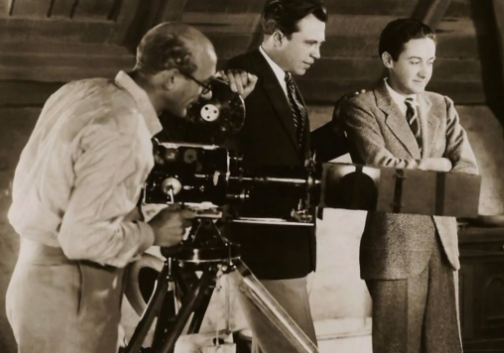 The MOOC may be taken for free and the only requirements for participating are a PC or Mac desktop or laptop computer, an Internet connection and an interest in learning to use digital storytelling tools and techniques to support teaching and learning. This MOOC is intended for K-12 teachers in all disciplines, although it is open to anyone with an interest in digital storytelling. Course participants will use WeVideo, a free web-based video editing program to create a digital story that can be shared online. Teachers in the state of Texas may be eligible to receive Continuing Education Units if they complete the major requirements of the course. Powerful Tools for Teaching and Learning: Digital Storytelling is currently being offered on-demand so interested students may sign up for the course at any time. The Humanities And Technology Camp is an open and inexpensive meeting where practitioners in the humanities and technologies collaborate in impromptu sessions to learn, build, and solve problems together. THATCamp is intended to open conversations on how scholars are using technology to work through problems and learn new skills. The first day will consist of sessions on how Humanists use digital technology in their work, while the second half-day will consist of workshops/training on specific tools and software. For more information about THATCamp, contact Dr. Thomas Cauvin (cauvin@louisiana.edu) or visit the conference website here. 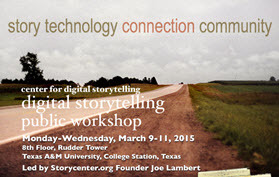 Joe Lambert, founder of the Center for Digital Storytelling, will conduct a digital storytelling workshop at Texas A&M University from March 9 - 11, 2015. The workshop is open to the public, although registration is limited. Click here for more information. ICIDS 2014 will take place in Singapore at the National University of Singapore, and marks the conference's first venture to Asia. The conference is hosted by the Department of Communications and New Media, National University of Singapore (http://www.fas.nus.edu.sg/cnm), in collaboration with the Keio-NUS CUTE Center (http://cutecenter.nus.edu.sg). The MOOC is free and the only requirement for participating is a PC or Mac desktop or laptop computer, an Internet connection and an interest in learning to use digital storytelling tools and techniques to support teaching and learning across different grade levels and multiple content areas. This MOOC is intended for K-12 teachers in all disciplines, although it is open to anyone with an interest in digital storytelling. Course participants will use WeVideo, a free web-based video editing program to create a digital story that can be shared online. Powerful Tools for Teaching and Learning: Digital Storytelling is scheduled to begin on September 8, 2014 and end on October 12, 2014. The U.S. Department of State and the National Geographic Society are partnering to launch the inaugural Fulbright-National Geographic Digital Storytelling Fellowship competition. This new component of the Fulbright Program will offer up to five awards to U.S. citizens. Over a nine month period, awardees will create multi-media stories on globally significant social or environmental topics including biodiversity, cities, climate change, cultures, energy, food, oceans, and water. The Fulbright-National Geographic Fellowship provides a unique platform for U.S. Fulbright awardees to build awareness of transnational challenges, comparing and contrasting cross-border issues. Fellows will share their stories through National Geographic’s platforms, using a variety of digital storytelling tools, including text, photography, video, audio, graphic illustrations, and/or social media. The deadline for submission is February 28, 2014. Through narrative, we learn from experience by reflecting upon experience, declaring what it means, and distilling it into a symbolic form to be expressed and remembered. Digital storytelling integrates oral storytelling with technology. Constructing a digital story requires individuals to organize information, write and utilize technology, but most importantly authors must reflect on experience (Barrett, 2005). Unlike oral stories that are subject to varying interpretations, digital stories are permanent artifacts capturing a specific moment in time; one telling of an experience that stands as an object for personal reflection and evaluation (Lathem, Reyes, & Qi, 2006). For additional information, contact Dr. Martha Green at mgreen@tamu.edu or 979-862-6700. This workshop will engage participants in the development of a digital story, provide theoretical support for the use of digital storytelling in education and qualitative research, and demonstrate pedagogical approaches for using digital storytelling in the writing and social studies classroom. Martha R. Green, Ph.D. is a program coordinator for Public Partnership & Outreach, Office of the Provost and Confucius Institute, Texas A&M University, and a lecturer in the Department of Teaching, Learning and Culture. She conducts workshops, does research, and teaches about digital storytelling and documentary development as tools for critical thinking, reflection and transformative learning. Lynne Masel Walters, Ph.D. is an associate professor in the Department of Teaching, Learning and Culture, Texas A&M University. From 2011-2013, she was a visiting associate professor, Universiti Utara Malaysia. With a doctorate in mass communication from the University of Wisconsin, her research and teaching focuses on media, technology and culture. 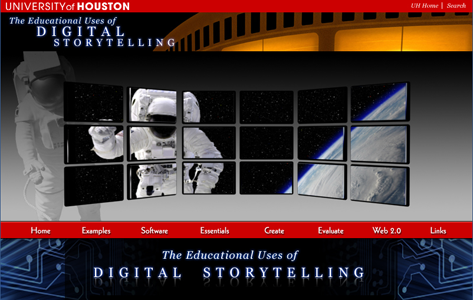 Welcome to the 2013 version of the Educational Uses of Digital Storytelling website. 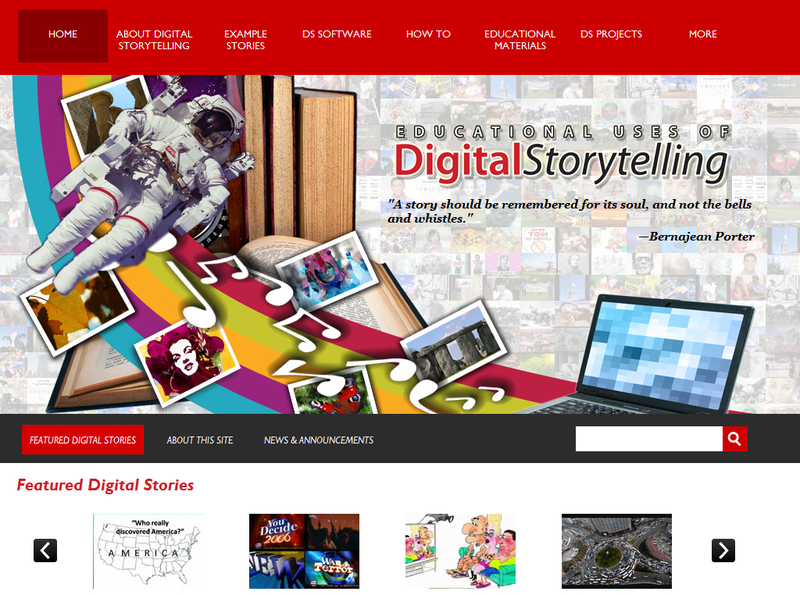 This new version has been in development for many months and although it is still a work in progress, I hope that you will find lots of interesting material on the site related to the use of digital storytelling in educational settings. The site is aimed at those just starting to explore this technology as well as long-time users as well as educators and students who are interested in exploring articles and research studies that deal with digital storytelling. and all of my current and former digital storytelling students who have contributed much of the content on the website. 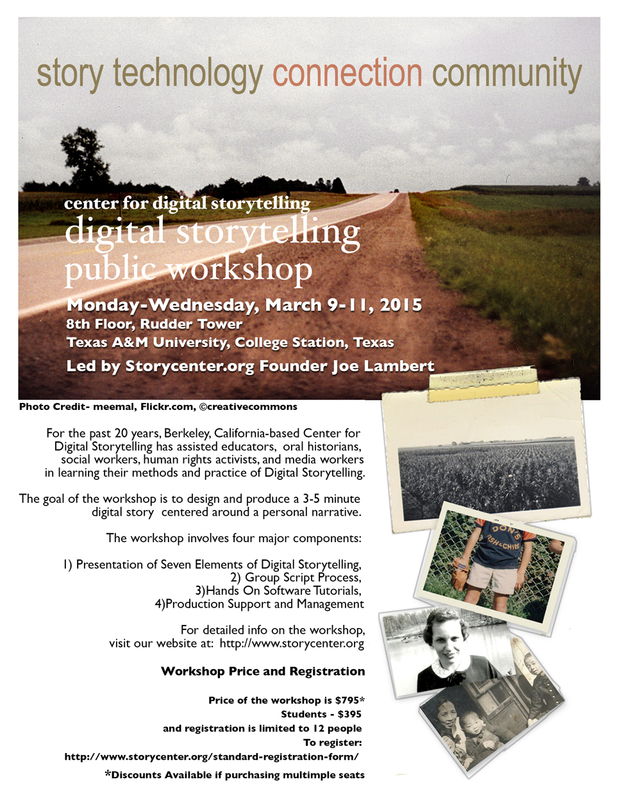 Thanks and happy digital storytelling! 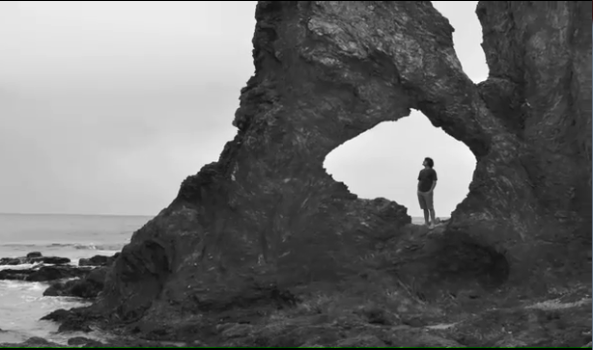 Powerful Tools for Teaching and Learning: Digital Storytelling is a 5-week MOOC that introduces educators to digital storytelling and explores ways that educators might use this technology tool to enhance their students’ learning experience. 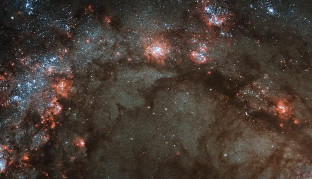 The MOOC will provide a solid foundation in the basic components of digital storytelling with tutorials, example stories and links to additional readings. The MOOC will also provide hands-on opportunities for learners to create their own digital stories. The MOOC may be taken for free or as a paid signature track student who will gain greater access to course content and peer feedback. 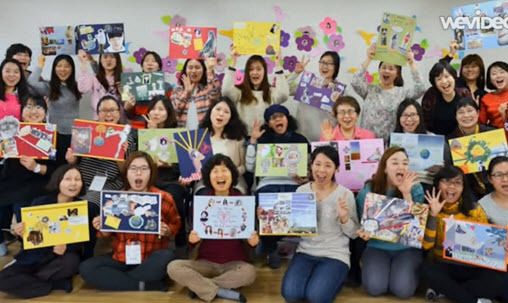 This MOOC is intended for K-12 teachers in all disciplines and at all grade levels, although it is open to anyone wishing to learn to use digital storytelling tools and techniques that can be used in educational, personal or professional contexts. Course participants will use WeVideo, an inexpensive web-based video editing program to create a digital story that can be shared online. Texas teachers in the United States may be eligible to receive Continuing Education Units if they complete the major requirements of the MOOC.